**3D INTERACTIVE TOUR** THE SELLER IS WILLING TO GIVE A CREDIT TO THE BUYER TOWARDS NEW GRANITE COUNTERTOPS IN THE KITCHEN. Pull up your driveway & be greeted with nice landscaping & walkway tiled front entrance. The great room is open & spacious to the kitchen & dining room w/ sliding glass doors that allow natural Florida sunlit to flow through & gives you access to an inviting backyard. The eat-in kitchen is fully equipped w/ all appliances, breakfast bar, cherrywood cabinets, laminate counter tops, plant shelves & closet pantry - a great place for that chef in your life! The master suite is extended w/ extra space for an office desk or reading nook, it also has bamboo flooring, ceiling fan, dual sinks, stand up shower, garden bath, customized walk in closet, linen closet & private toilet stall. The guest bath includes a tub/shower combo, vanity, toilet & linen closet. Both the 2nd & 3rd bedrooms have brand new carpet, ceiling fans & over-sized bi-folding closets. Mature oaks & plants provide a private tranquil wooded backyard that can be enjoyed from the extended screened-in lanai & brick paver patio which are perfect spots for entertaining family & friends! The inside laundry room features custom cabinets & the garage has epoxy flooring with a workshop complete with electric! 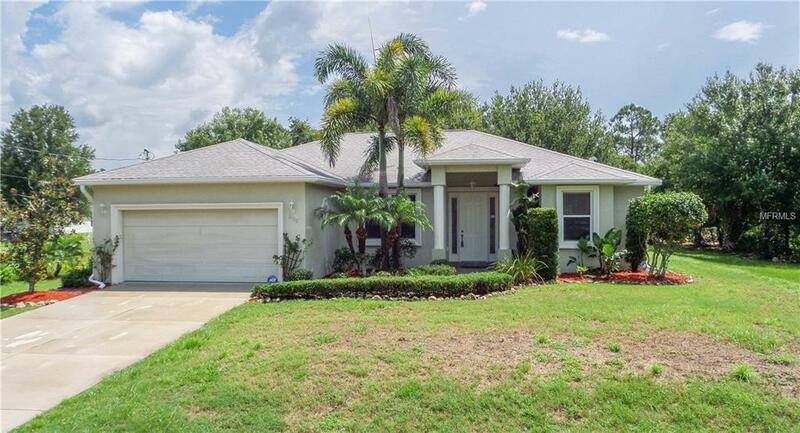 This home is located in a desirable area of North Port, you will be near great shopping, golf courses, parks, schools and I-75. Put this home on your "must-see" list! !